"The Punjab Government under the leadership of the Chief Minister, Captain Amarinder Singh is all set to carry out comprehensive amendments in the sports policy with the aim to make it sportsperson friendly and bolstering the sporting infrastructure in the state. "This was disclosed here today by the Sports and Youth Affairs Minister, Punjab, Rana Gurmit Singh Sodhi, himself an ace shooter while interacting with the mediapersons during a press conference.Addressing the mediapersons after holding wide ranging discussions with the departmental officers on assuming the charge as Sports Minister, Rana Sodhi said that the new sports policy would carry many significant characteristics such as enhancement of the prize money for medal winners from Punjab at International Level besides increasing the pension of the veteran players, reviving the long stopped Maharaja Ranjit Singh Awards and increasing the prize amount, permanent provision of jobs for the medal winning players and reviving the District Olympic Associations as well as the District Sports Councils. He further said that Punjab that once enjoyed numero uno status in the sports field has lagged behind since many years whereas Haryana has surged ahead of Punjab. He divulged that the sports budget of Haryana is much bigger than that of Punjab. He also informed that he has taken up the issue of increasing the sports budget with the Chief Minister, Captain Amarinder Singh and sooner a meeting would also be held with the Finance Minister Mr. Manpreet Singh Badal. Rana Sodhi further added that the trend of the migration of players hailing from Punjab to the other states has increased.He also added that in order to reverse the trend, the prize money in cash awarded to the medal winners from Punjab at International Level would be increased.Apart from this, arrangements would be made for giving jobs to the medal winners.He also elaborated that at present the Olympic/World Cup or World Championship medal winner veterans get Rs. 5000 per month as pension which is proposed to be increased to Rs. 15000. Similarly, the veteran medal winners from Asian and Commonwealth Games would get an enhanced pension from Rs. 2500 to Rs. 5000 as per the proposed vision.The Sports Minister said that long stopped Maharaja Ranjit Singh Awards, given to the Punjab players on the pattern of National Awards, would be revived in a grand function soon to be held. He divulged that a policy would be chalked out to ensure holding of this award ceremony every year and the present prize money of the awards at Rs. 2 lakh would also see increase. Rana Sodhi also said that,"I feel honoured to say that when Maharaja Ranjit Singh awards were started in 1978 I was also a recipient and at that time the prize money used to be Rs. 2500. when I was the Chief Parliamentary Secretary in the previous tenure of Captain Amarinder Singh the prize money was increased from Rs. 21000 to Rs. 1 lakh which would now be enhanced further. "Rana Sodhi also detailed that in order to create a sports friendly atmosphere in Punjab and attract the youth towards sporting activities the near defunct District Olympic Associations and the District Sports Councils would be revived.The Deputy Commissioners would be instructed in writing to prop up the sporting activities. He also said the Sports University to be established at Patiala would also bolster the sports culture in the state. In order to construct infrastructural facilities for sports at Rs. 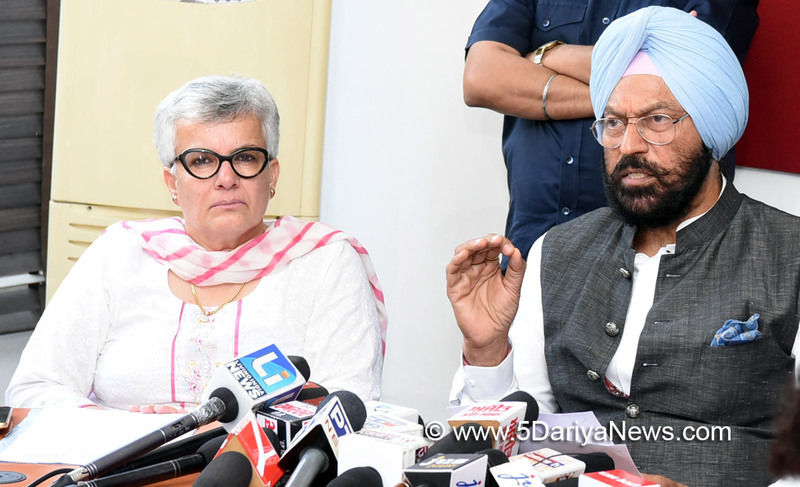 32.90 crore, 10 new stadia would come up and 2 shooting ranges would be transformed and given fresh lease of life.Further listing his futuristic vision, Rana Sodhi said that the shooting ranges at Muktsar Sahib, and Mohali would be upgraded, a multipurpose stadium at Gidderbaha at a cost of Rs. 1 crore, Block level stadiums at Guru Harsahai, Tanda Urmur, Gidderbaha and Khadoor Sahib at a cost of Rs. 6.25 crore and hockey Astroturf at a cost of Rs. 3 crore at Dhudike in Moga would also come up. Besides this, under KHELO INDIA scheme a multipurpose indoor hall stadium at Tarntaran at a cost of Rs. 2.18 crore, a multipurpose indoor stadium at war heroes stadium in Sangrur at a cost of Rs. 7.47 crore and an athletics track, a multipurpose stadium and a swimming pool at sports complex Hoshiarpur at a cost of Rs. 7 crore would also be constructed.The Sports Minister also said that as the KHELO INDIA scheme measures would be formulated to promote the para sports players. Besides this, regional centres for sports at Majha, Malwa and Doaba and devoting special attention to sports in the border areas are also in the pipeline.On the occasion, Director Sports Mrs. Amrit Kaur Gill, Assistant Director Mr. Kartar Singh Sembi, Executive Deputy Director Mr. Surjit Singh, DCFA Mr. Pawan Kumar and Joint Secretary of the Punjab State Sports Council Engineer Sanjay Mahajan were also present.